I have had a surprisingly fabulous day. I willingly and enthusiastically let my Kindergartner play hookie today so we could go to the park for a picnic and go shopping. Baby in tow, of course, but as close to one-on-one time as I get with her these days. And we had a blast. She picked out a funky hat and a scarf headband that I kind of want to borrow - too bad she's only 5. Why was it so fabulous.............because kids are fun when you feel great. And they behave, and the sun is shining, and YOU FEEL GREAT. They aren't that fun when you don't feel good. I don't want to say it but I'm saying it anyway- they feel like a real chore when you don't feel good. And when you feel terrible they can feel completely overwhelming. Why is it surprising..............because I haven't been feeling consistently great for a while now. I've had some good days or partially good days. Some okay days. And some really off days. But today was a great day. Pray for me that it means I've turned a corner on this Candida business because I like enjoying my kids. Its one of the main reasons I am determined to straighten out what is wrong with me. Its why I had kids. They sense when I like being with them versus it being a chore for me. And I want them to feel liked. Part of this figuring out what is wrong with me business is all about listening to my body and recognizing my symptoms. If any of you have suffered or suspect you are suffering from leaky gut, food sensitivities, Candida, Adrenal fatigue or low iron - or all of them at once - you will probably know that many of the symptoms are similar or overlapping. That's what makes it so hard to figure out what is going on. Especially when they are all happening at once. I have been on the Candida diet (strict phase) for about 5 weeks now. The first 4 weeks were a bit experimental as I tried (and failed miserably) to incorporate/keep some grains, fruit and small portions of higher carb vegetables in the diet. So for 4 weeks I was going through Candida die-off and flare-ups alternatively - but couldn't really figure out which was which. Five weeks ago, I also got my IGG food panels back and eliminated any food sensitivities from my diet. For the past week I have been following the most strict version of the Candida diet to a tee and I started taking some much stronger anti-fungals. And voila - after 5 days of feeling off (see below - Candida die-off) I am feeling better. So by process of elimination, a little intuition and lots of paying attention to my body I think I'm starting to figure these symptoms out. Low iron - My low iron symptoms were primarily extreme dizziness and extreme fatigue. The dizziness was the "I need to hold onto something or I'm going to fall over" type not the "I feel a little nauseous" type that I felt when I had morning sickness. The fatigue was both physical fatigue (i.e. I can barely lift my baby) and sleepiness (i.e. I could not make it through the afternoon without a nap). Anxiety, Anxiety, Anxiety - irrational fears of death - usually in the form of disease and sometimes end of world scenarios. Intellectually I would KNOW that it was me "over-reacting" and I would try to stop it but I couldn't. Very frustrating. My brain doesn't let it go when it gets a grip on something if I'm in this state. It is not depression. I don't feel sad. I feel anxious. Fatigue - I think the main thing is that I wake up feeling not rested. A generally feeling of low energy throughout the whole day. Not necessarily sleepiness, just not much get up and go. Low blood sugar/blood sugar swings- before the Candida started flaring up this would hit me really badly in the late morning/early afternoon (11 - 2), especially if I didn't eat enough protein at regular intervals. Hunger and cravings - these go hand in hand. I am a bottomless pit. I could eat and eat and eat and never be full. I crave sweets and always sweets. Sugar is my drug of choice not carbs. I can live without the carbs but the sugar haunts me. If I'm not careful I overeat and get indigestion which just perpetuates the Candida. Vicious cycle. Slow digestion - enough said. I don't like to talk about my bowel habits to strangers. Or it might be that the slow digestion of something my stomach can't handle flares the Candida. Either way they seem to go together. Anger - holy Dinna I get pissed off. I have a short fuse. Low patience. Mad. This is not me. This is not who I am. When it starts happening I try to have a pep talk with myself that its not "____(fill in the blank) its just the Candida". Doesn't matter - Candida doesn't listen to reason. I still feel mad. Then I feel mad and frustrated. Like bad PMS. Usually between 3/4 and 6/7 pm. And then it lifts. Tiredness. I wake up feeling rested. I just don't have enough energy to quite make it through the entire day. By evening I was POOPED. Had to go to bed at 8:30 one night. Brain fog - This was bad. I felt completely out of it. Spacey. Not quite dizzy but kind of off kilter. Almost like my brain was fuzzy. Hard to think straight and follow a conversation. So there you have it. I figure if I can sort out the symptoms I will be closer to figuring out what is causing them for good. And I'm getting closer. The low iron is fixed for now. The AF seems to be at bay. I just need to get a long-term handle on the Candida. But I'm happy to report I slept deeply last night, woke up rested, had lots of energy all day, had normal amounts of hunger (I think I will always be a bit hungry) and had no anxiety or anger. I had a lovely day. My kids felt well liked. Hopefully we are on track for a summer full of great days. 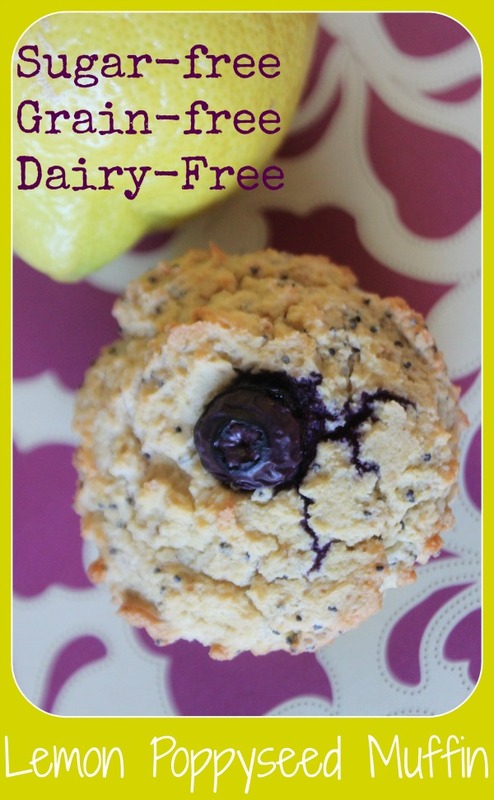 Okay - if you read all that you deserve to eat a yummy sugar-free, grain-free muffin................go for it! Line your muffin baking pan with 12 large liners. Don't skip this step. Combine dry ingredients and mix thoroughly. Set aside. Separate egg yolk and egg white into two separate mixing bowls. Add vanilla, coconut milk, coconut oil, lemon and Stevia to egg yolks. Mix to combine. Add egg yolk mixture to dry ingredients and mix until fully combined. Add liquid egg whites to separated egg white. Using a hand mixer, blend until egg is fluffy and starts forming peaks. This should take a couple of minutes on medium speed. Gently fold egg white mixture into batter. 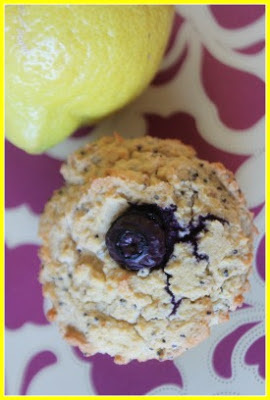 Place about 1/4 cup of batter into each muffin liner. Smooth out the top of each one with the back of a spoon. Top each one with one blueberry for garnish. Bake for 20 to 25 minutes or until a knife in the center comes out clean. You've probably already figured out that the night sweats are from die-off.